On a cold but beautiful mid-November day, Lynn and I found ourselves with fellow photographer, Fred Mast, on the commuter rail headed for downtown Denver. In an upcoming Travel Tuesday, we’ll feature more views of the downtown area and the 16th Street Mall. 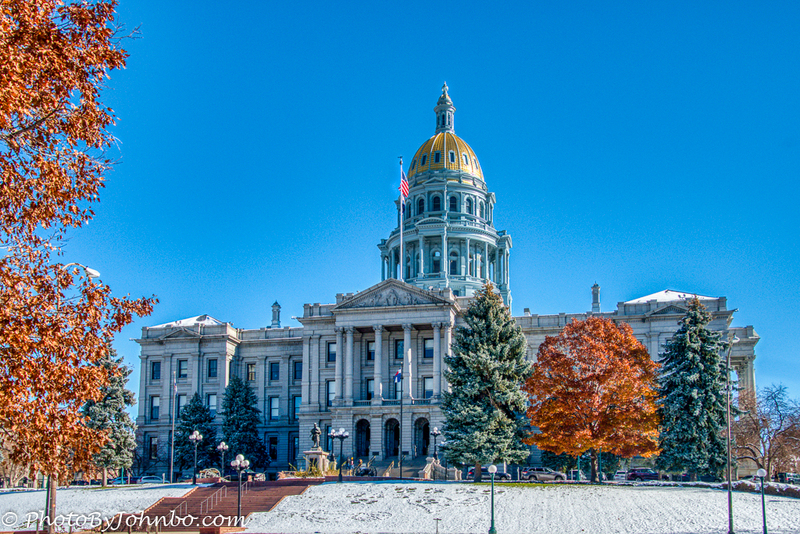 Today’s Travel Tuesday, however, features a visit to the State Capitol Building, Colorado’s seat of government. The photo above features a view of the building that sits almost exactly one mile above sea level. An official marker placed on the 13th step indicates the exact one-mile point. The beautiful golden dome is anchored at the east end of the Civic Center Park. The building itself is constructed of a rare red marble known as rose onyx and it was quarried near the town of Beulah, Colorado. The centerpiece dome was originally made of copper, but in 1908, the dome was plated with gold leaf. The latest replating of the dome happened in 2013 and contains only 65 ounces of gold leaf. 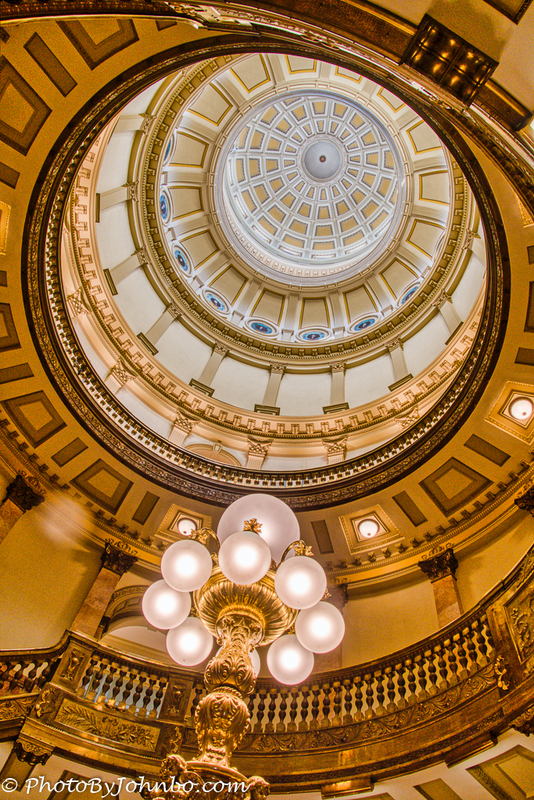 After entering the building and clearing security, one of the first things you will view inside the building is the center atrium where you can look upward to view the beautiful interior construction finishes of the dome. During our visit, we were pretty much free to wander the building. There was no legislative activity scheduled, so we wandered around at will enjoying the beautiful architecture. During the week, however, free historical tours are available for walk-in visitors from 10 AM to 3 PM weekdays. Large groups and those with special needs can make a reservation so that proper accommodations can be provided. In the Gallery of Presidents, President Trump’s portrait had not yet been placed on the wall. As it turns out, we were there as they were just getting ready to install the portrait. When we first went by, two people were apparently getting ready for the ceremony. We paused briefly to visit with the woman captured in the image below. Two years after his election, President Trump’s portrait was not yet hanging next to his colleagues. The reason is funding. The portrait, which cost around $10,000 USD is not paid by public funds and it took nearly two years to raise the funds and have the portrait commissioned and completed. As time was short and our plans included visits to other downtown sites, we did not stay for the hanging of the portrait. In researching for this story, I did find out more details about the funding. As of late July, 2018, there had been not one dollar earned toward the portrait acquisition. All of the portraits in the gallery were either donated or acquired by private fundraising activities. Then the Colorado Senate Majority Leader tweeted the post below. 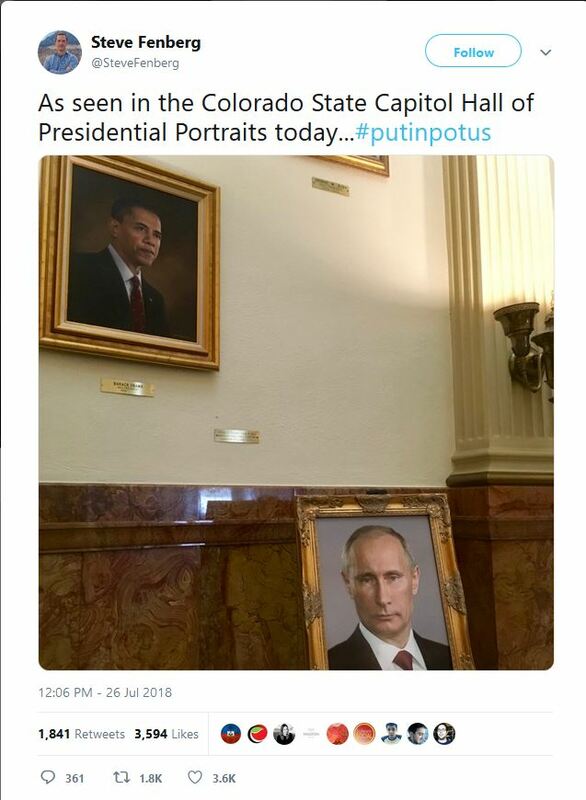 A prankster had placed a portrait of Russian President Putin in the gallery. 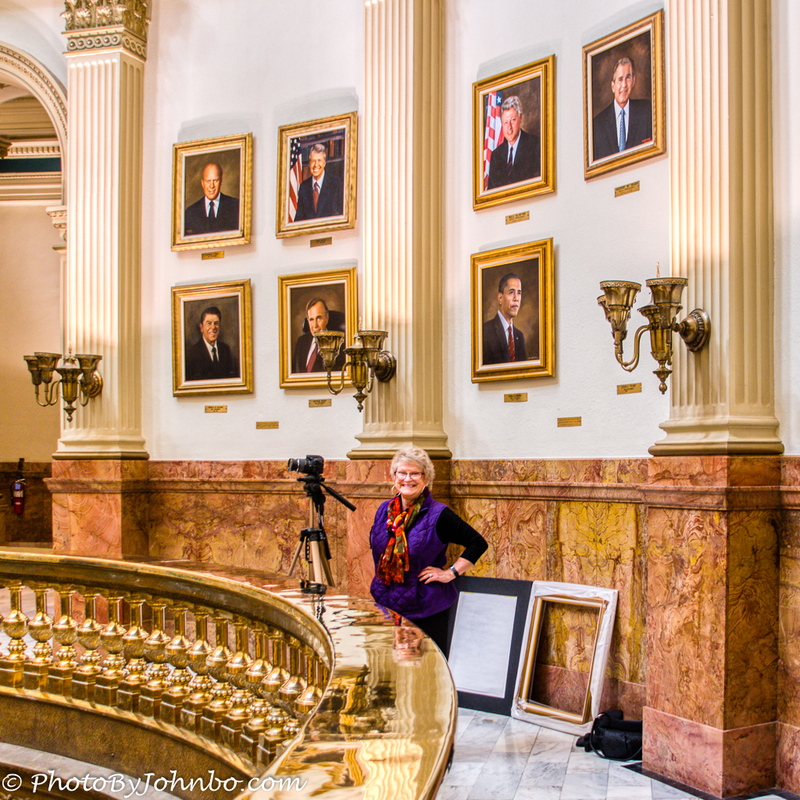 That prank led to the creation of a GoFundMe page for the portrait by Colorado Senate President Kevin J. Grantham and by July 31, nearly all of the $10,000 was raised. 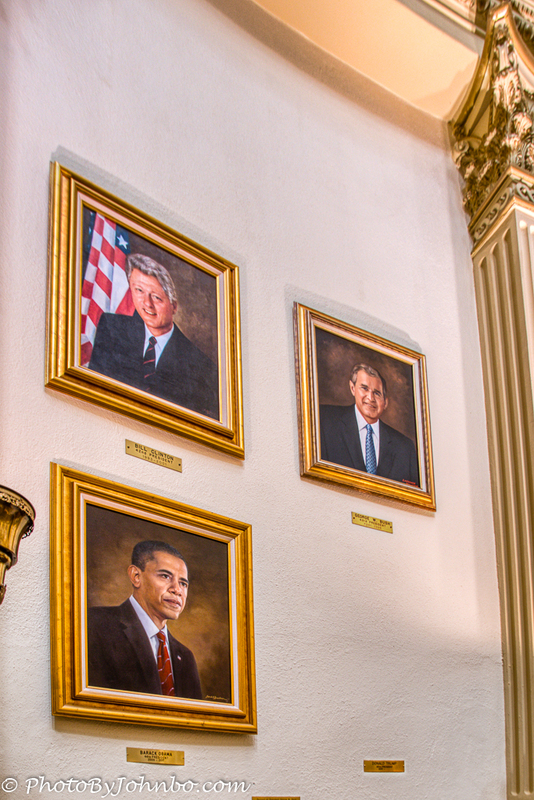 The responsibility for overseeing the artist’s payment and hanging of Presidential Portraits belongs to a group known as Colorado Citizens for Culture. You can read the original stories from which I drew this information here and here. Historical references for this post were found here. As the legislature was not in session on the day of our visit, we were free to wander into the house and senate chambers. A student tour was in progress during our visit, so we quietly captured a few images of the beautiful chamber and left quietly. 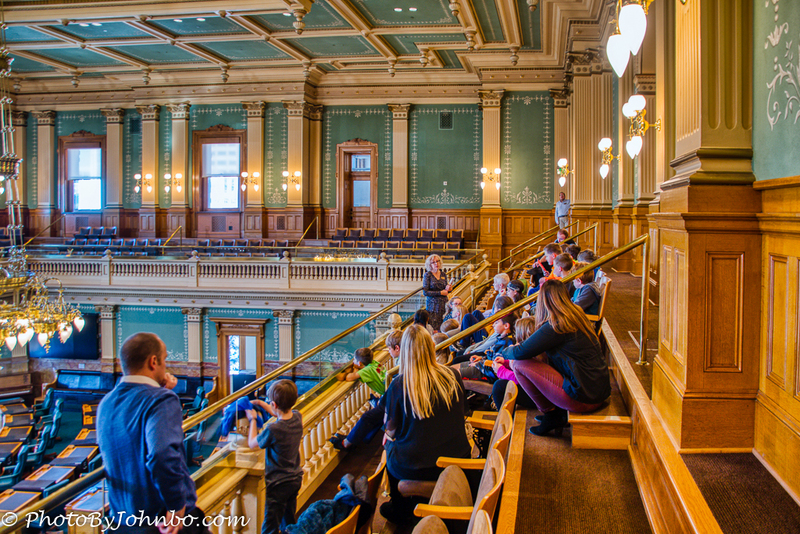 I submit for your review a collection of images captured that day in the Colorado State Capitol building. In most browsers, you can click on an image to enlarge it and to scroll through the gallery. Wow palatial indeed. What an interesting couple of sub lines with the painting funding and the Putin prank! Nicely done!